If you are new to Joomla you need to know that RocketTheme are one of the pioneers of the themes business. If you are looking for a theme then they are one of the companies that should be on your list. Not to be unfair to the others but if you are creating a list of suppliers then you should also add Joomla Bamboo, Shape 5 and Template Plazza. 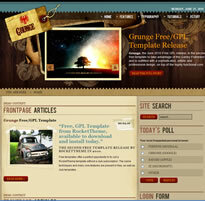 RocketTheme also provide a number of free Joomla themes, the one to the right is the latest one, called Grunge. I'm sure you can find others to add to the list but from our experience these guys pretty much tick all the boxes in terms of frameworks, extensions, designs, themes and support. We've spent lots of time in the past looking at others and things could have changed but if it isn't broke, don't fix it - we are happy with these four. So, to the news. For the next three days you can get a 15% discount at RocketTheme and all you have to do to get it is click here. It is also worth noting that the discount is applicable for new, renewal, and upgrade sign ups and to get it, you have to use the promotion code happybdayjoomla on the sign up page. So, if you are a member or not, the clock is ticking and it is a fantastic offer. Otherwise, if you are new to themes, RocketTheme have loads of free themes to play with and the very lovely Gantry Framework.